On the heels of Facebook’s disclosure about the active measures Russian operatives have taken to exploit social media for disinformation, the Pew Research Center released findings of an ongoing tracking study showing that two-thirds (67%) of American now get at least some of their news via social media platforms. While that represents only a modest increase since early 2016 -- the height of the Presidential primaries -- when 62% of Americans reported getting news from social media, the increase is being driven more by greater adoption among older, less educated and nonwhite Americans. The study, conducted Aug. 8-21 and based on a survey of 4,971 adults, found that, for the first time, more than half (55%) of Americans age 50 and older say they get news from social media outlets. That represents a 10 percentage point increase from Pew’s last survey on the topic in 2016. And those social media outlets include many more platforms, including some newer and rapidly rising ones. 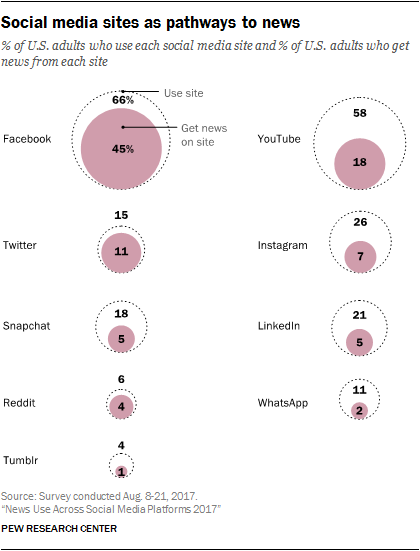 Twitter, YouTube and Snapchat have grown the most as a source of news. Instagram, LinkedIn and WhatsApp are also becoming significant sources.